These elegant cigarette cases, made of gold and adorned with precious gems, were luxurious possessions, carried in the pockets of well-heeled residents of Mexico. In the late 18th and early 19th centuries, however, cigarettes were everywhere in New Spain. Smoking was neither a taste nor privilege of only the elite. 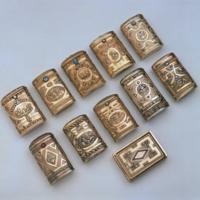 Cigarette cases like these were usually decorated on both sides. Made at different times by different goldsmiths, this collection shows a range of imagery. The one in the top row, second from left, features two versions of figures, perhaps children, running through a landscape setting. In the second row, second from right, the central image depicts a dove nestled among flowers, with a tiny golden branch grasped in its beak. The base of this case bears marks indicating it was made in Mexico City, of pure metal that had been legally assayed and upon which full duties had been paid. The goldsmith’s initials also appear. The box in the second row, second from left, is decorated with a dog, dove, and child beneath a glowing sun and shows how different colors of gold could be combined for pictorial effect. The cigarettes used in these cases were smaller and thinner than the ones smoked today. Their lids had hidden hinges and with a quick press of a clasp, the case would open. 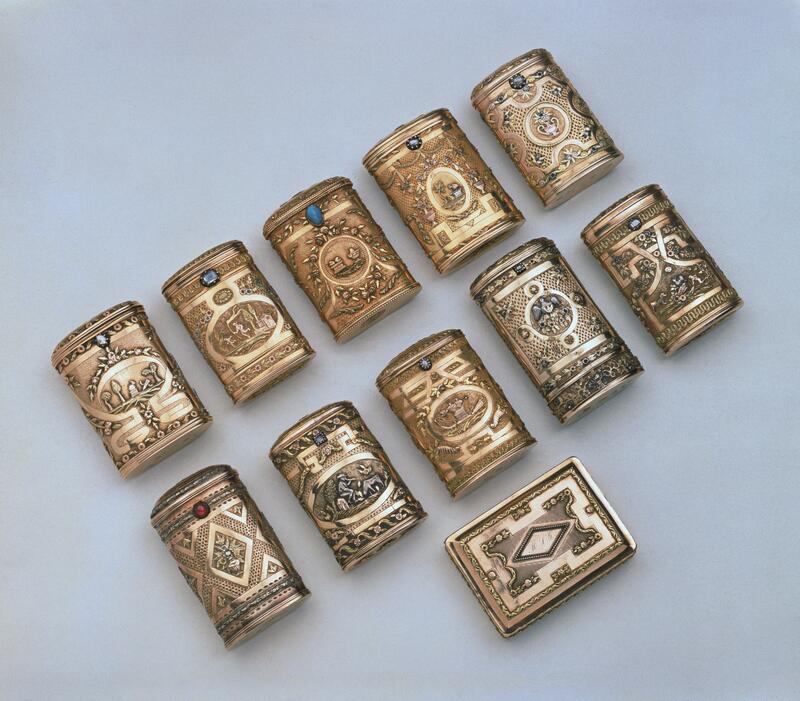 Fancy cigarette cases were made by goldsmiths in Mexico. Some cases display their maker’s initials while others are anonymous. Throughout the colonial period, goldsmiths belonged to guilds, but around the time these works were made, the guild system was being challenged as Mexico City’s art academy, the Academia de San Carlos, became the state-of-the-art training ground for artists and artisans. Goldsmiths worked with twenty-karat gold and cut diamonds or semi-precious stones. These smiths spared nothing in terms of craftsmanship. Their decorative techniques include chiseling, stamping, polishing, and the juxtaposition of different colors of gold. Many of these cases (which measure between 6.5 to 7 cm long) also bear a suite of official marks, indicating the purity of the gold, where the object was made, and that proper taxes and duties had been paid upon the metal. All of these cases are today in the Museo Franz Mayer, in Mexico City. The luxury and fine craftsmanship of these boxes indicate an urban origin, not only for their creators but also their owners. And several of these cases bear marks indicating they were indeed made in Mexico City. The décor of high-end cigarette cases of the late 18th and early 19th centuries often aligns with tastes first developed in France, particularly Paris. After the French Bourbons ascended the Spanish throne in 1700, both Spanish and Spanish American objects reflected their French tastes. Starting in the 18th century, the Bourbon monarchs held a monopoly on cigarette production. In Mexico City, by the early 19th century, hundreds of people were rolling cigarettes in the royal factory. Licensed stores across the city—a majority of which were managed by women—sold the cigarettes that might eventually fill boxes like this one; a painting of such a cigarette shop is connected to this one. Thus cigarettes conjoined the daily habits of colonial officials, wealthy ladies and gentlemen, and poor workers. Deans-Smith, Susan. 1992. Bureaucrats, planters and workers: the making of the tobacco monopoly in Bourbon Mexico. Austin: University of Texas Press. Esteras Martín, Cristina. 2002. “Cigarette Case/ Cigarrera." In The Grandeur of Viceregal mexico: Treasures from the Museo Franz Mayer/ La grandeza del México virreinal: tesoros del Museo Franz Mayer. Houston and Mexico City: The Museum of Fine Arts, Houston and Museo Franz Mayer, 286-292.